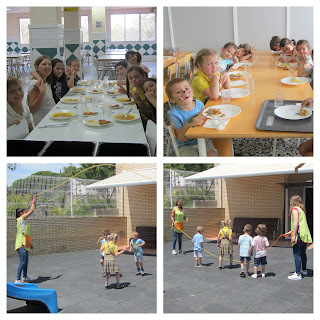 The children's course and the primary are in school retreats, but this is not a problem for us so we had a good time playing at the playground and we lunch with a lot of tranquility! The students can pass more time with the monitors and they can play more with them. We have played to jump rope with the little ones and the other children play what they want at the playground. We will take advantage that on Monday everything returns to normality!! !